Improve Heavy Use areas around your livestock watering troughs or at barn doors. This fabric is used under stone to allow water to infiltrate into the soil below while preventing vegetation to grow up through. It provides a buffer between the soil and the stone so that the stone stays in place without being trampled into mud. It creates a dryer, cleaner and safer heavy use area for your livestock and prevents soil erosion on your land. 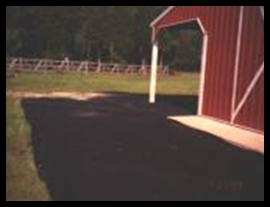 Use on stone driveways prevents potholes and the tracking of mud onto paved streets from vehicular traffic. The Conservation District offers this filter fabric to York County residents for $3.00 per running foot X 15 feet wide (slightly higher for out-of-county residents). That is 15 square feet for only 20 cents per square foot. 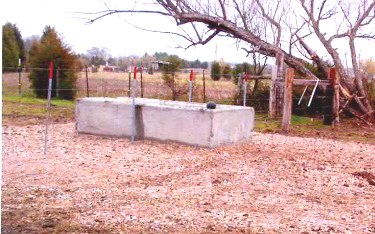 A typical heavy use watering area for cattle (24' x 24') would require two 24 foot pieces costing just $144.00. Save on the cost of constantly re-stoning your heavy use areas by applying this material - and never have to stone again. To place your order, call the Conservation District at 803-684-3137 x 101. Staff are available to help you determine how much you need for your heavy use improvement project. A full roll, pictured below, is also available. It measures 15 feet by 300 feet. Pictured below are two applications for using filter fabric. At left is a heavy use area around barn entrances - fabric is applied and will be covered with stone. At right is a livestock watering trough where the fabric has been covered with four inches of stone. The fabric allows water to filter through but provides a barrier between the stone and the soil below so that the stone cannot be trampled into the mud. The fabric is also suitable to stabilize stream beds and to lay below stone driveways to keep the stone in place. This is a cost effective method of providing long-lasting heavy use areas.